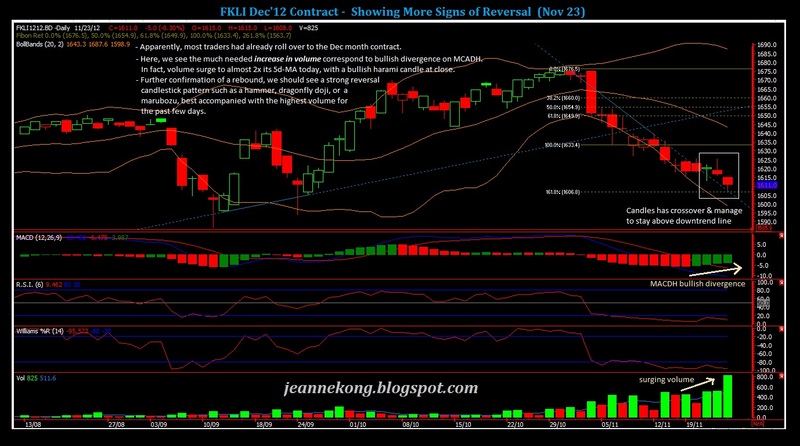 Following my previous post on FKLI, we close the week without any strong reversal signal. Below are my charts as of today's close. 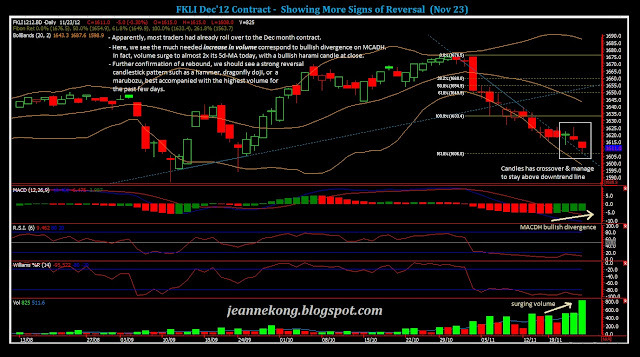 I was wondering why the volume is not contributing its part to signal the coming reversal on the FKLI spot month chart. I thought, since when Malaysian celebrates Thanksgiving so heavily that the volume become so pathetic on the index futures?? Then, it strikes me when I check on the Dec'12 contract chart, all the volume has been running to the Dec'12, apparently!! We can see climbing volume bars on the Dec'12 chart, with today's volume the highest (almost 2x its 5d average). That's much more promising than the bleak picture on the spot month chart. However, I'll wait for the confirmation on Monday to make a LONG entry. No shame to double- or, triple-confirm, as this is a heck of a looooooong & most persistent downtrend I have ever seen on the FKLI, a whole string of REDs for three weeks. I'll be looking for strong reversal pattern on Monday/Tuesday, something like a hammer, dragonfly doji, bullish engufling, morning star.....Any one of those will be most welcomed, together with a highest volume bar. For those who are not familiar with candlestick patterns, I highly recommend this cute little site called BabyPips.com, where they explain the story behind each popular candlestick pattern/formation, so that you can quickly pick up the underlying meaning in each of them. Do be diligent, & start following their babypips school lessons, all the way from PreSchool to Graduation! Alrighty! Happy Hunting & be prepared for the most lucrative trading month of December! Good to get know your blog today. Not usual to see young lady who interested on futures trading since I am in this field. So more you are quit from your professional job into this field. Good luck to you and wish you all the best. From your blog, I am not sure how you study the market although you did mentioned that you are work on "number game" anf preference to be positional trader. For me, I am focus to mechanical trading systems. -- Setups are with rules base. 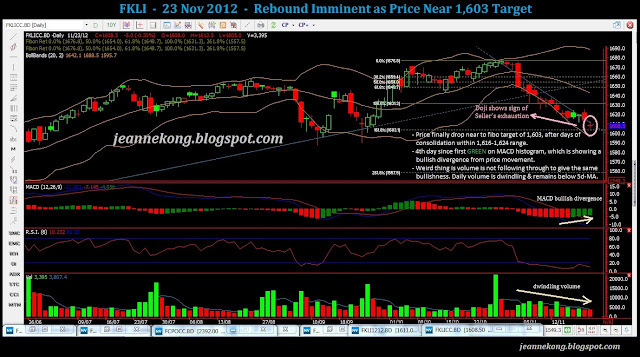 I think "engineerer" like this type of trading approch. Hopefully we can learn and exchange idea more this in the future. Hi EMT! Great to hear form you. Alexander Elder once said, female traders are must possess some extra quality & skills, for them to survive in this male-dominance playing field. I use classical TA....plus a little added support of indicators. I'm sort of a right-brainer, though I'm into these TA/engineering/numbers stuff. & I guess maybe that's why I use more of classical TA methods than computerized analysis. Nevertheless, I believe mechanical trading system can help eliminate the all-important greed & fear factor & psychological stress we encounter when we trade. When I'm in doubt, I check my analysis with MA system, if they differs, I'll be very cautious with taking that trade. It works more like a back-up/2nd opinion for me.